A 3 wire Pt100 resistance thermometer 6mm diameter, 20mm stainless steel sheathed constructed with double sided adjustable bayonet fitting spring loaded and powder packed to give excellent vibration resistance. 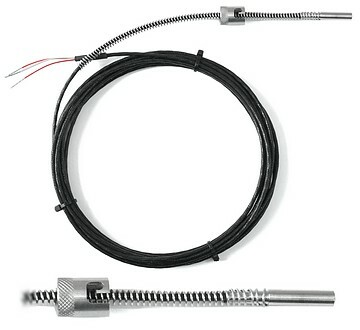 The unit comes with 5 metres of 7/0.2 PTFE Insulated and sleeved connecting lead. The resistance thermometer can be used up to 400°C in the harshest of environments, to measure bearing temperatures, mould temperatures, etc.